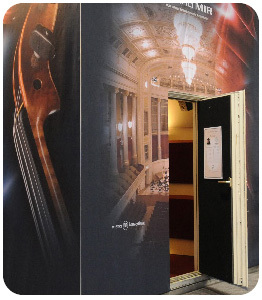 Blue Sky User Profile: Vienna Symphonic Library | abluesky.com : Audio Design Labs Inc.
Vienna Symphonic Library, an innovative, music software and sample library developer based in Vienna, Austria, premiered its long-awaited Vienna MIR reverb software at the 2009 Winter NAMM Show, in daily demonstrations within an intimate, soundproof Presentation Cube. The “Cube” was originally created by Austrian acoustics designer, Peter Willensdorfer of tonachitektur for VSL’s first public appearance at the 2002 AES Convention. In anticipation of VSL’s new launch in January, VSL decided to completely renovate the Cube—from the aesthetics to the audio—featuring Blue Sky’s state-of-the-art Sky System One 5.1 Surround System. Posted by Pascal Sijen | Filed Under News!